Kanban boards have the unique advantage of making it easy to visualize and manage the day-to-day 'work in progress'. Drag-and-drop is a core feature in any Kanban tool. When a user moves a card from one column to another the status updates automatically. With the drag-and-drop feature, moving to the next stage of business process is as easy as a single mouse move. 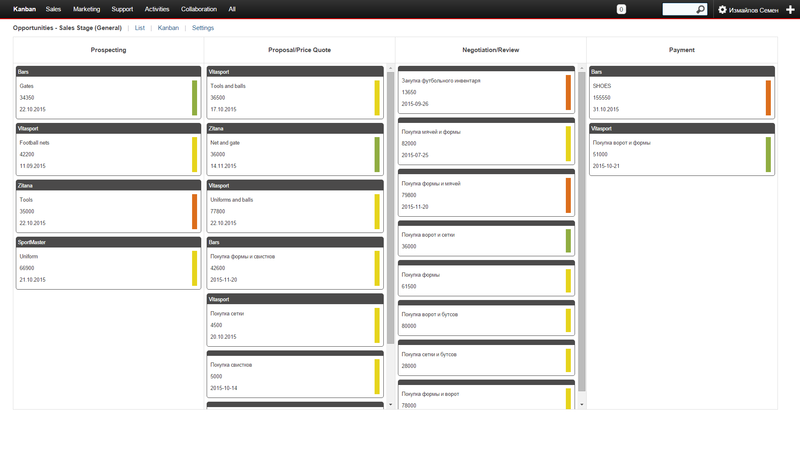 You can work with any SuiteCRM module in a Kanban view. The only requirement is to have at least one dropdown list in that module. This dropdown list is used to group cards (i.e. module records) into Kanban columns. Of course, the widest spread Kanban view is Sales Pipeline. This view uses the Opportunities module and Sales stage dropdown list. You can see another popular Kanban use cases below. Kanban is a great tool to have a clearer picture of how things are going in general. With color indication user can see not only general view over all his deals but see and manage every single deal on the same screen. 1. Red color means «alarm» - user missed some planned activities. 2. Yellow color means «warning» - user does not have any planned activities. It is not good because if card is in a process then user always should have planned activity. 3. Green color means everything is fine with a card: there is something planned to do with card and there is no missed activities. Kanban configuration is our pride. Thanks to universal approach in creating new Kanban board, user can make Kanban for every module in SuiteCRM. The only requirements is dropdown list in this module. This dropdown list is used to group cards into Kanban columns. Users can configure by themselves what information they want to see in card header and in card body. Users can configure what stages they want to have on Kanban board and what stages are final for the process. Users can have as many Kanban boards as they needed. It is possible to have different Kanban boards for one module with different columns . Administrator can create Kanban boards for all users. Users by themselves can modify this Kanban boards for their private usage and can add private Kanban board. Board builds on Opportunities module. Opportunities group by sales stages. This board helps user to manage all opportunities on a single page in a convenient and simple view. Board builds on Leads module. Leads group by status. Purpose is very similar to the board above. Board builds on Account module. Accounts group by status. This board is very useful if users do not work with lead module and presales activities are going in Account module. Board builds on Cases module. Cases group by status. It helps to lead open cases through all work stages. Board builds on Project module. Projects group by status. Board builds on Tasks module. Tasks group by status. Actually, this board is a classic application of Kanban board. It is mostly used in agile project management.